You can find the link for the giveaway at the end of this post. About a year ago I decided to cut off my long hair and sport a new look. I’m very glad I did. A few months later we moved to our plot in the countryside and our lives got a little more complicated. We are leaving home at 5h45 to miss the traffic into Cape Town. Therefore, being up so early means I cannot spend too much time fussing with my hair in the mornings. We only have twenty minutes to get ready for our day and feed our pets. My new short hair style only takes a few minutes to prepare in the mornings. I wet it to make sure it’s not standing on end and… that’s it. In the mornings, my hair has a tendency to look like I stuck my fingers in a power outlet. I am very pleased with my current hair style as it’s extremely easy for me to manage when being short of time. It will also be easy to manage when we are working with building materials and the associated dirt when it comes to working on the container house project. Who is my hair dresser? When I decided to cut my hair, I had to find a new hairdresser as my previous one was no longer in the industry. 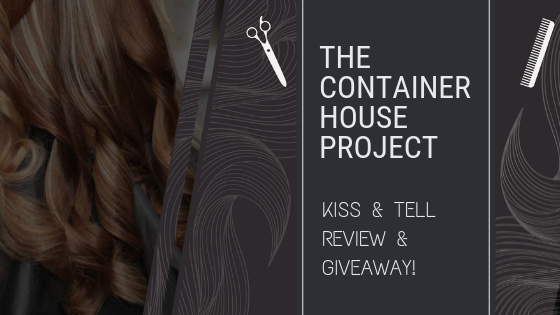 I had heard about Kiss & Tell and Chantelle came highly recommended. Chantelle works from her studio located behind a home in Pinelands (Cape Town). The studio overlooks the beautiful backyard and if you look carefully you might even see Chantelle’s rabbit hiding under a bush. It’s a lovely atmosphere to walk into as you prepare for a bit of pampering. Then there’s the studio, which is amazing. Most hair salons have wash basins that make you sit in the most uncomfortable position while your hair is washed, leaving you in need of the services of a chiropractor. Chantelle’s equipment lets you lie down and enjoy the head massage that’s a part of her services. Of course, with our current water situation in Cape Town, there are now many buckets (and a rain water tank) involved in the process, but Chantelle has been sure to keep this aspect of her business running with only a few small changes to the winning recipe. Believe it or not, the hair-washing aspect is the longest part of the hair-cutting procedure. Chantelle is extremely deft with scissors. Before you know it, your hair is perfect and you are ready to show-off your new do. She must be related to Edward Scissorhands. I always think that Chantelle’s studio has a kind of 80’s vibe to it but I can’t quite put my finger on what it is that gives me this impression. Is it the decor? No. Is it the lively music? No. Is it the hot cup of tea or coffee that you are offered? No again. Perhaps it is the refreshing, fruity fragrance of the hair products? Perhaps. I really am not sure, but I do feel at home at Kiss & Tell Hair Studio and am sure you will too. If you want to book an appointment with Chantelle at Kiss & Tell Hair Studio, you can find her details in our directory listing here. You have a chance to win a voucher for a four step treatment at Kiss & Tell Hair Studio that includes a wash and a blow dry. What a treat for both guys and girls!